Professionals at the Insurance Institute for Highway Safety (IIHS) put each car through the paces, checking the likelihood of injury from frontal and side crashes. They assign a rating of Poor, Marginal, Acceptable and Good to each car. As a government agency, the National Highway Traffic Safety Administration (NHTSA) conducts similar tests to see how likely it would be for the driver and passengers to get hurt in common collisions. The best vehicles get five stars while the poorest ones get one star. 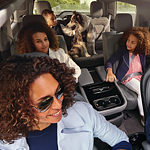 Our team at Barnes Crossing Mitsubishi can tell you more as well as set you up to take a test drive in your chosen car.